Berenice Abbott’s detail-laden photographs of a long-ago New York City enrapture Charles Simic so thoroughly that the past isn’t dead, it’s not even past. 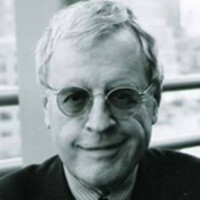 “Can one experience nostalgia for a time and place one did not know?” That’s the question Charles Simic asks in “The Life of Images.” Of course, the answer is yes. Simic looks at photographs by Berenice Abbott and loses himself in the details of the street life spontaneously captured forever in an image. It’s “the enigma of the ordinary” that fascinates him and stimulates his memory and imagination. Simic conjures up not only histories and narratives for these people but evokes the past through the senses—containers stuffed with pickles and slices of raw onion, the smell of talcum powder on a freshly shaved neck, Ella Fitzgerald singing “If That’s What You’re Thinking About, You’re Wrong”. In a straightforward style, Simic packs in more images and ideas in this brief essay than some writers fit in an entire book. Originally published in Harvard Review in 2003, and collected in the fine anthology, The Life of Images, it appears here with the author’s permission. In one of Berenice Abbott's photographs of the Lower East Side, I recall a store sign advertising Silk Underwear. Underneath, there was the additional information about “reasonable prices for peddlers.” How interesting, I thought. Did someone carry a suitcase full of ladies’ underwear and try to peddle them on some street corner further uptown? Or did he ring doorbells in apartment buildings and offer them to housewives? I imagine the underwear came in many different sizes so he may have had to carry two suitcases. The peddler was most likely an immigrant and had difficulty making himself understood. What he wanted is for the lady of the house to feel how soft the silk was but she either did not understand him or she had other reasons for hesitating. She wore a house robe, her hair was loose as if she just got out of bed, so she was embarrassed to touch the undies draped over his extended hand. Then she finally did touch them. The reason photographs live in my memory is that the city I continue to roam is still rich with such visual delights. Everyone who does the same is already taking imaginary snapshots. For all I know, my face briefly glimpsed in a crowd may live on in someone's memory too. The attentive eye makes the world mysterious. Some men or a woman going about their business seventy years ago either caught sight of a camera pointed at them or they passed by oblivious. It was like hide-and-seek. They thought they had concealed themselves in plain view and the camera found them out. It showed something even they did not know they were hiding. Often people had the puzzled look of someone who had volunteered to assist a hypnotist on a stage and who had awakened at the sound of the applause of the audience. I'm looking at the long-torn-down Second Avenue “El” at the intersection of Division Street and Bowery in another Abbott photograph. The date is April 24, 1936. It seems like a nice day, for the sunlight streams through the tracks and iron scaffolds of the elevated train making patterns of shadow and light on the sidewalk below. As far as I can make out, the street on both sides is lined up with stores selling cheap furs. The entire area was for years a bargain hunter's paradise. My father knew a fellow in his office, an elderly, impeccably dressed man, who claimed that he did all his shopping on Orchard and Hester Streets where he never paid more than five dollars for a suit. What interests me the most in this photograph are the shadowy couple under the El with their backs turned to us. She's willowy and taller than he is as if she were a model or a salesgirl in one of these shops. They have drawn close together as if talking over something very important, or why would they otherwise stop like that in the middle of the street? The way this woman in a long skirt carries herself gives me the impression that she is young. Not so the man. With one hand casually resting on a post and his other stuck in his pocket, he appears confident, even brash. It's the way they stand together that suggests to me that they are not casual acquaintances. Most likely they work in the same neighborhood, but there is something else going on between them too. She seems very interested in what he is saying now. No one else in view pays them any attention. The fellow standing on the sidewalk in front of the Beauty Fur Shop looks off into the distance where a portly young man with glasses wearing an open overcoat over a three-piece suit is coming into view. He has just had lunch and is glancing idly at the shop windows as he strolls lazily back to the office. He is too young to be the boss, so he must be the son or the son-in-law of one of the storeowners. Except for the couple who elude being identified, there is nothing unusual here. A photograph such as this one, where time has stopped on an ordinary scene full of innuendoes, partakes of the infinite. I cannot look long at any old photograph of the city without hearing some music in the background. The moment that happens, I'm transported into the past so vividly no one can convince me that I did not live in that moment. I have heard just about every recording of popular music and jazz made between 1920 and 1950. This is probably the most esoteric knowledge I possess. It's easier to talk to people about Tibetan Buddhism, Arab poetry in medieval Spain, or Russian icons, than about Helen Kane, Annette Hanshaw, and Ethel Waters. Or how about some Boswell Sisters or Joe Venuti and his Blue Four, Red McKenzie and his Mound City Blue Blowers, Ted Lewis and his orchestra playing “Egyptian Ella”? It scares me how much of that music is in my head. I have friends who cannot believe that I can enjoy both Mahler's symphonies and Coleman Hawkins. Young Ella Fitzgerald singing “If That's What You're Thinking, You're Wrong” with Chick Webb's band would be just right for Abbott's shadowy couple. Can one experience nostalgia for a time and place one did not know? I believe one can. You can put me in solitary with Abbott's photograph of “Blossom Restaurant” and I wouldn't notice the months pass away as I study the menu chalked on the blackboard at its entrance. The prices, of course, are incredibly low, but that's secondary. The dishes enumerated here are what fascinates me. No one eats that kind of food today. Rare Mongolian, Patagonian, and Afghan specialties are procurable in New York, but not lamb-oxtail stew, boiled beef, or even stuffed peppers. The ethnic makeup of the city has changed in the last thirty years. Most of the luncheonettes in the '50s and '60s served samplings of German, Hungarian, and Jewish cuisine. Pea and bean soup, stuffed cabbage, corned beef and boiled potatoes, and veal cutlets were to be found regularly on the menu together with the usual assortment of sandwiches. On every table, and all along the counter, there were containers stocked with dill pickles and slices of raw onion. The portions served were enormous. A cheap dish like franks and kraut would stuff one for the rest of the day. I subsisted for years on soups and chowders cooked by a Greek in a greasy spoon on East 8th Street. They gave you two thick slices of rye bread and butter with the soup and all the pickles you could eat. After that, I could hardly keep my eyes open for the rest of the day. Abbott's photograph of the Blossom Restaurant front also includes the barbershop next door with its own price list. Does any tonsorial establishment still offer electric massage anywhere in this country? The gadget which resembled contraptions from a horror film and which the barber placed on the customer's head was made of a mesh of spring coils and electric wires. Once the juice was turned on, the massager squirmed and shook for a minute or two over the customer's scalp supposedly providing a stimulating, healthful, up-to-date treatment while one sat back in the chair pretending to be absorbed in some article in the Police Gazette. That ordeal was followed by a few sprinkles of strong-smelling cologne from a large bottle and a dusting of the freshly shaved neck with talcum powder. Which reminds me. The worst haircut I ever had in my life was at a barber college at the Union Square subway station. “Learn Barbering and Make Money” the sign said. It was the cheapest haircut in town. However, before I realized what was happening, the apprentice barber had cut off all my hair with clippers except for a tuft right up in front. The kid was clearly a hair fashion visionary decades ahead of his time, but back then I was in total panic. I rushed immediately across the street into Klein's department store and found a beret, which I wore pulled down over my ears for the next six weeks. The problem was that it was summer, hot and humid as it usually is in New York. I also wore dark glasses to give the impression that I was simply affecting the appearance of a jazz musician. I saw both Dizzy Gillespie and Thelonious Monk similarly decked out, but they tended to make their appearance only after dark while I had to go to work in the morning in a storeroom of a publishing company where everyone who saw me burst out laughing. Lunch was a hassle too. The customers at adjoining tables snickered and the waitress who knew me well gave me a puzzled look as she brought me my sandwich. I always held unpopular opinions and was not afraid to voice them, but to have people stare at me because I had a funny haircut or wore a necktie of some outrageous hue was something I had no stomach for. “My place is no bigger than a closet,” a woman said to her companion on the street just the other day as they rushed past me and I saw it instantly with its clutter of furniture and its piles of clothes on the bed and the floor. Dickinson's “Madonna dim” came to my mind and I did not even take a good look at her before she was lost in the crowd. No sooner has one seen an interesting face in the street than one gives them a biography to go along with the face. Through a small window in her room, the evening casts its first shadow on a blank wall where the outline of a picture that once hung there is still visible. She is not home yet, but there is a small bird in the cage waiting for her and so am I.
Mr. Nobody is what I call the man in the subway I catch sight of from time to time. He has labored all his life to make himself inconspicuous in dress and manner and has nearly succeeded. He sits in the far corner so we may glance at him without seeing his gray hat, gray moustache, pale collapsing cheeks and empty watery eyes as he stares off into space while the subway train grinds along and the overhead lights go out briefly and return to find us puzzled, looking up from newspapers at each other sitting there. Even more odd than these searching looks one gives strangers are the times when one catches someone doing the same to us. They see me as I truly am, one imagines—wanting both to run away from them and to ask what it is they saw. Today dozens of people are sunning themselves on park benches, sitting close together with eyes shut as if making a collective wish. An old mutt who has done a lot of thinking and sighing in his life lies at their feet eyeing a rusty pigeon take wing as I pass by. The enigma of the ordinary—that’s what makes old photographs so poignant: An ancient streetcar in sepia color. A few men holding on to their hats on a windy day. They hurry with their faces averted except for one befuddled old fellow who has stopped and is looking over his shoulder at what we cannot see, but where, we suspect, we ourselves will be coming into view someday, as hurried and ephemeral as any one of them.